Geologic and topographic maps at a scale of 1:24,000 (1 inch on the map = 24,000 inches on the ground) are available in Kentucky. Kentucky is one of only a few states that have complete coverage at this scale. Each map illustrates an area of 7.5 minutes of longitude and latitude, or approximately 7 x 9 miles square. Topographic maps illustrate landscape (hills, valleys, etc.) in units of elevation above sea level, and show prominent surface topographic features (streams, roads, buildings, etc.). Geologic maps overlay the bedrock geology on the topography. On each geologic map are explanations of the types and relative age (system level) of the bedrock strata. Also listed are descriptions of the bedrock and economic geology of the area. The name of the topographic map and geologic maps are the same, because they cover the same area. The letters "GQ" are placed before the geologic map number below to designate geologic quadrangle. The following is a list of quadrangles and their GQ numbers for Fayette County. Information from these GQ's was used in the summary of the county geology. See references for additional information and complete citations. All of the bedrock in Fayette County are of Ordovician age. 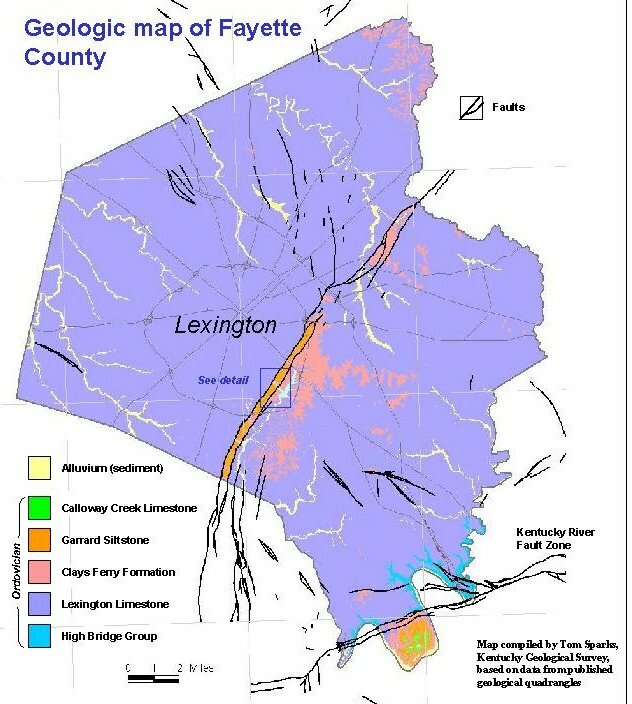 The purple color on the map indicates areas underlain by the Lexington Limestone, a unit of rocks containing mostly limestone, and shale. The pink areas are underlain by a unit of rocks called the Clays Ferry Formation. This unit is mostly composed of shale. The orange areas are underlain by the Garrard Formation, a unit dominated by siltstone. The Garrard is brought to the surface within the Kentucky River Fault zone. The Bryan Station fault is the name of the main fault in the fault zone, which cuts across the county along a northeast-southwest trend. These faults have not moved in human history. The faults are indicated on the map by thick, black lines. Faults also cut across the southern part of the County, along the Kentucky River. The blue color on the map is a group of limestones and dolomites called the High Bridge Group. These strata are only exposed along the Kentucky River, and form the cliffs of the Palisades. Note that south of the faults on the river, different units of rock are at the surface than north of the faults. This is because of ancient movement along the faults. The north side has moved down relative to the south side. Streams are filled with sediment eroded from the bedrock, which is drawn in yellow on the map. Fayette County lies within the Inner Blue Grass of the Blue Grass Region. The Inner Blue Grass is characterized by gently rolling topography underlain by a unit of limestone and shale called the Lexington Limestone. This limestone contains minerals (natural fertilizers), which accumulate in the soil and provide the basis for the regions' agriculture and "blue" grass. In the Outer Blue Grass, other rock units underly the surface resulting in a more rolling, and more deeply dissected landscape. The limestone bedrock is easily dissolved by ground water resulting in features called "karst" by geologists. Springs, sink holes, and sinking creeks are characteristic of karst areas. 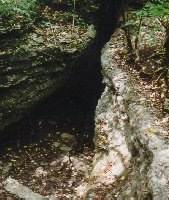 Good examples of these features can be seen at McConnell Springs in Lexington. On the southern border of the county, the Kentucky River cuts a narrow gorge into the Blue Grass. The gorge is called the Kentucky River Palisades and can be seen The Palisades can be seen from the bridges on Interstate Highway 75, and U.S. Highway 27 at Camp Nelson, and at High Bridge. Trails at Raven Run Nature Sanctuary also have great views of the Palisades. The oldest bedrock in the county are exposed in the limestones at river level. Lat: 37° 53' 08" Long: 84° 25' 08"
Lat: 37° 50' 57" Long: 84° 26' 01"
Rocks: Abundant limestone and shale, uncommon dolostone (also called dolomite), and sandstone. 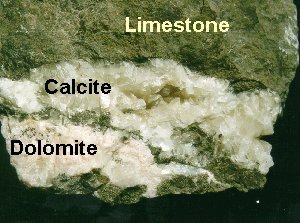 Minerals: Calcite and dolomite (the mineral) sometimes fill voids and cracks in limestone and dolostone, especially near fault zones. Barite, fluorite, sphalerite, and galena occur in vein deposits near the Kentucky River, but few are accessible for collecting. The geologic quadrangle maps show where these units occur at the surface, and some indicate areas where fossils have been collected, as well as descriptions of the types of fossils found. Exposures of these units are the best place to look for fossils in the County. Collecting should always be done with adult supervision. Remember to respect private property. Also, be careful along roadways, railway exposures, at other areas where vehicles pose a hazard. Limestone is the chief geologic resource in the county, with two mines currently in operation. 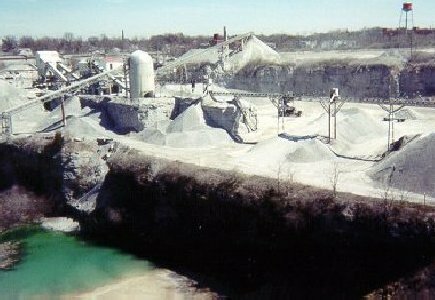 One large quarry even occurs near downtown Lexington. The limestone from these mines is used mostly as aggregate for use in construction materials (concrete, asphalt). Limestone from the Tyrone Limestone and dolostone from the Oregon Formation are quarried for dimension stone, which is stone that is cut and sawed to specific dimensions. In the past, local limestones were used in foundations, facing stones, and stone fences, which can still be seen throughout the county. Several mineral veins have been encountered during limestone quarrying. Barite veins were heavily mined in the early 1900's. Minerals such as fluorite, calcite, sphalerite, and galena were encountered in these veins but were not found in economic quantities. Clays have been used locally as lining for stocked ponds. Residual clay in the vicinity of New Circle and Nicholasville Roads in Lexington was used in the manufacture of bricks. A few holes have been drilled for oil, but there has never been any oil production in Fayette County. Bryan Station Fault, part of the Lexington Fault System, cuts through Lexington, but there does not appear to have been any movement along the fault for a long time. Many other faults cross the county, and are also inactive. Faulting is most visible in exposures along U.S. Highway 27, near Camp Nelson, south of the Fayette County line, in Garrard County. Cross sections on the Coletown, Lexington East, and Nicholasville geologic quadrangle maps depict offsets along the faults. 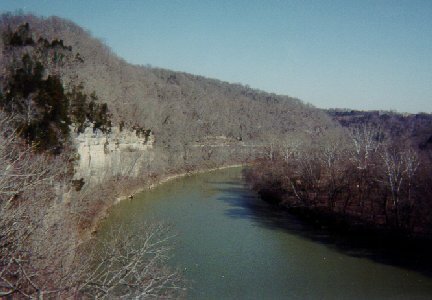 The Kentucky River cuts a deep valley, called the Kentucky River Palisades, along the southern edge of the county. The Palisades can be seen from the bridges on Interstate Highway 75, and U.S. Highway 27 at Camp Nelson, and at High Bridge. Trails at Raven Run Nature Sanctuary also have great views of the Palisades. The oldest strata in the county occur at river level in the Palisades. Sinkholes and other karst features are common in the county, although in urban areas they are often covered by artificial fill. Caverns extend laterally, some for considerable distances from sinks, and may be close to, but unobserved at the surface. 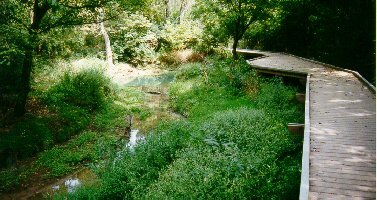 The city of Lexington was founded at McConnell Springs, a natural spring, which may have formed through the connection of several collapsed sinkholes. Sinkholes also can be seen at Beaumont Park, and at the University of Kentucky, between the new library and the Mining and Mineral Resources Building. In the Paris West quadrangle, some sinkholes are as deep as 100 feet. Unfortunately, many were used as dumping sites for years and became salty and sulfuric. A good discussion of the engineering geology problems in the county can be found on the Lexington West quadrangle (Miller, 1967). The Kentucky Geological Survey is a research institute of the University of Kentucky, actively engaged in applied and basic research of the state's mineral and water resources. To learn more about the Survey visit the home page of this Web site. 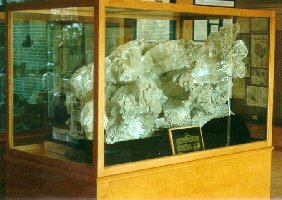 Visitors to the Survey can see mineral exhibits in the atrium, including the largest gypsum crystals found east of the Mississippi River, beautiful western Kentucky fluorite loaned from the Clement Mineral collection, a display of Kentucky meteorites, and a display of fluorescent minerals from the Trenton, New Jersey, area. Fossils and minerals are also on display on the second floor. The Office of Geologic Information, on the first floor, provides public access to ground-water data, oil and gas data, and coal-resource information. The Publication Sales office, also on the first floor, sells maps and publications about Kentucky geology. Geologists are on hand to answer earth science questions. Tours of the exhibits and laboratories are available for school groups . Please call (859) 257-5500 to arrange a visit. The Survey is open from 8:00 a.m. to 5:00 p.m. weekdays, and is located next to the Hilary J. Boone Center, across Rose Street from the Chemistry and Physics Building on the University of Kentucky campus. Parking is available behind the Hilary J. Boone Center. The Department of Geological Sciences offers classes in the earth sciences and provides earth science information. Geologists are on hand to answer earth science questions from 9:00 a.m. to 5:00 p.m. weekdays during the school semester. The Hudnall Museum of Geological Sciences has exhibits of fossils, rocks, and minerals. School group tours are available. Please call (859) 257-3758 to arrange a visit. The department is located in the Slone Research Building on the University of Kentucky's central campus. The Geological Sciences Library and Hudnall Museum of Geological Sciences are located in Bowman Hall. For more information, visit the department's web site or call (859) 257-3758. Metered parking is available behind the Slone Research Building and in the Medical Center parking lot. In June of 1775, a group of explorers was camped at a natural spring in the middle of what is now Fayette County when they received information telling of the first battle of the American Revolution in Lexington, Massachusetts on April 19. In honor of the battle, the explorers, who included the McConnell brothers, named their settlement Lexington. Since the naming of Lexington, the spring has served as the site for a mill, a gunpowder factory, a source of water for distillers, a dairy farm, a stockyard, a rock quarry, and now a recreational area. Most of these operations hinged on the availability of fresh ground water in a city that was removed from a major river source. The availability of ground water is still critical to the economy of the Inner Blue Grass Region. McConnell Springs is located off Old Frankfort Pike inside New Circle Road, west of the Vulcan-Central Rock stone operation (at 38° 03' 39" N, 84° 31' 51" W). The park offers paved trails, ample parking, a protected shelter, visitors office, and amphitheater. The park is open daily from dawn until dusk. School groups are welcome. Call (859) 258-3132 for more information. 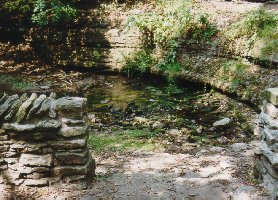 The springs occur in a small valley, developed in the Lexington Limestone. The site is a karst "window," where the visitor can actually look into the ground and see the ground-water system. The window has evolved over thousands of years through the interaction of water movement and the bedrock. The springs are in a deep hole, sometimes called a blue hole, where ground water rises up from below to the surface. This water flows along briefly as a surface stream and then disappears underground, only to reappear again several hundred feet away as springs coming out of the limestone bedrock and bubbling up from below. Sometimes water in the main spring shoots several feet in the air after a heavy rain, a phenomenon called an artesian head. Once again the water flows several hundred feet and disappears into a large, natural conduit, called a swallow hole. Raven Run Nature Sanctuary is operated by the Lexington-Fayette Urban County Division of Parks and Recreation. It is located off of Jacks Creek road in the southern part of Fayette County and has a visitors center and hiking trails. The sanctuary is open to the public Wednesday through Sunday; hours vary according to season. The park is very popular, especially on weekends and during spring flower season. Group tours should be arranged in advance. For information about tours and special activities, call the sanctuary at (859) 272-6105 or the Division of Parks at (859) 255-0835. Trails in the sanctuary offer views of the Kentucky River Palisades from cliffs 100 feet above the river. At the Palisades, rocks from the Lexington Limestone and High Bridge Group are well exposed in the cliff walls above the river. On the trail to the overlook, the Tyrone Limestone forms the bedrock, and fossil coral mounds and mud cracks are exposed along the trail. 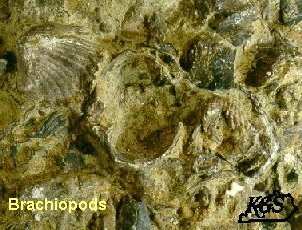 At the overlook, the Camp Nelson Formation is exposed, and the limestone contains large snail and cephalopod fossils. A geologic guide for the park is available at the visitors center (Greb and others, 1985). Black, D.F.B., 1967, Geologic map of the Coletown quadrangle, East-central Kentucky: U.S. Geologic Survey Geologic Quadrangle Map GQ-644, scale 1:24,000. Cressman, E.R., 1965, Geologic map of the Keene quadrangle, central Kentucky: U.S. Geologic Survey Geologic Quadrangle Map GQ-440, scale 1:24,000. Cressman, E.R., 1967, Geologic map of the Georgetown quadrangle, Fayette and Scott Counties, Kentucky: U.S. Geologic Survey Geologic Quadrangle Map GQ-605, scale 1:24,000. Dever, G.R., Jr., 1980, High-carbonate and low silica stone in the High Bridge Group (Middle Ordovician), Fayette County, central Kentucky: Kentucky Geological Survey, Ser. 11, Information Circular 4, 45 p.
Kanizay, S.P., and Cressman, E.R., 1967, Geologic map of the Centerville quadrangle, central Kentucky: U.S. Geologic Survey Geologic Quadrangle Map GQ-653, scale 1:24,000. MacQuown, W.C., Jr., 1968, Geologic map of the Clintonville quadrangle, central Kentucky: U.S. Geologic Survey Geologic Quadrangle Map GQ-717, scale 1:24,000. 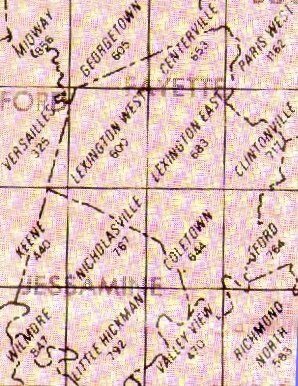 MacQuown, W.C., Jr., 1968, Geologic map of the Nicholasville quadrangle, Jessamine and Fayette Counties, Kentucky: U.S. Geologic Survey Geologic Quadrangle Map GQ-767, scale 1:24,000. MacQuown, W.C. Jr. and Dobrovolny, E, 1968, Geologic map of the Lexington East quadrangle, Fayette and Bourbon Counties, Kentucky: U.S. Geologic Survey Geologic Quadrangle Map GQ-683, scale 1:24,000. Miller, R.D., 1967, Geologic map of the Lexington West quadrangle, Fayette and Scott Counties, Kentucky: U.S. Geologic Survey Geologic Quadrangle Map GQ-600, scale 1:24,000. Outerbridge, W.F., C.E., 1974, Geologic map of the Paris West quadrangle, Bourbon and Fayette Counties, Kentucky: U. S. Geologic Survey Geologic Quadrangle Map GQ-1162, scale 1:24,000. Anderson, W.H., Van, S., and Greb, S.F., 1997, Minerals of the Blue grass-The Central Kentucky Mineral District, in Greb, S.F., Dever, G.R., Jr., and Anderson, W.H., eds., Economic geology of the Inner Blue Grass Region (guidebook for Kentucky Society of Professional Geologists, 1997 field conference): Kentucky Society of Professional Geologists, p. 11-16. Black, D.F.B., Cressman, E.R., and MacQuown, W.C., Jr., 1965, The Lexington Limestone (Middle Ordovician) of central Kentucky: U.S. Geological Survey Bulletin 1224-C, 29 p.
Cressman, E.R., 1973, Lithostratigraphy and depositional environments of the Lexington Limestone (Ordovician) of central Kentucky: U.S. Geological Survey Professional Paper 768, 61 p.
Cressman, E.R., and Noger, M.C., 1976, Tidal-flat environments in the High Bridge Group (Middle Ordovician) of central Kentucky: Kentucky Geological Survey, ser. 10, Report of Investigations 18, 15 p.
Dever, G.R., 1997, Stone industry in central Kentucky, in Greb, S.F., Dever, G.R., Jr., and Anderson, W.H., eds., Economic geology of the Inner Blue Grass Region (guidebook for Kentucky Society of Professional Geologists, 1997 field conference): Kentucky Society of Professional Geologists, p. 4-6. Greb, S.F., Baker, B., and Earle, D., 1985, Geology of the Raven Run Nature Sanctuary: Lexington, Ky., Raven Run Nature Sanctuary, 17 p.
Greb, S.F., Dever, G.R., Jr., and Anderson, W.H., 1997, Economic geology of the Inner Blue Grass Region (guidebook for Kentucky Society of Professional Geologists, 1997 field conference): Kentucky Society of Professional Geologists, 47 p.
Haney, D.C., and Noger, M.C., 1992, Roadside geology along Interstate Highway 75 in Kentucky: Kentucky Geological Survey, ser. 11, Special Publication 16, 39 p.
Kiefer, J.D., and Greb, S.F., 1997, Hydrogeology of McConnell Springs, Lexington, Kentucky, in Greb, S.F., Dever, G.R., Jr., and Anderson, W.H., eds., Economic geology of the Inner Blue Grass Region, (guidebook for Kentucky Society of Professional Geologists, 1997 field conference): Kentucky Society of Professional Geologists, p. 32-34. McFarlan, A.C., 1943, Geology of Kentucky: Lexington, University of Kentucky, 531 p.